KINGSTON, Jamaica (FinalCall.com)- A wide cross section of Jamaicans came out on to hear the Honorable Minister Louis Farrakhan deliver a Saturday afternoon message at the Wyndham Hotel in Kingston. The crowd digested the Minister’s message Dec. 10 as he encouraged Jamaicans to become self-reliant and to look to regional integration for collective survival. Jamaica is being bought out and if this continues, the country will soon become the playground of the super-rich, and the masses of the people will once again be relegated to the role of servants, “hewers of wood and drawers of water,” said Min. Farrakhan. He encouraged the formation of a strategic alliance between the intelligentsia and the grassroots activists to move the country forward. Political, social, religious and class division is sentencing Jamaicans to death, he warned. Visiting the island before Dec. 29 general elections recently announced by Prime Minister Andrew Holness, Min. Farrakhan warned his audience not to place all their hopes on politicians, who maybe influenced by forces that do not have the interest of the masses at heart. His advice was very timely, as the level of intimidation in the country is known to increase during election season. Jamaica’s prime minister has called for peaceful elections as political violence has been a problem in the past. Violence has lessened from past years, but remains a concern. The worst election violence was in 1980 when police reported 800 people killed in the process. While on the island, the Minister met with P.J. Patterson and Edward Seaga, former prime ministers of the People’s National Party (PNP) and Jamaican Labour Party (JLP), respectively. Minister Farrakhan recounted for his audience’s benefit, the nature of this visit. Both former prime ministers admitted whichever Party wins, there will be little or no quick change in the lives of the general population. Minister Farrakhan reiterated that each party that comes into power should build on the good work of the previous administration so Jamaica and the Caribbean can grow. 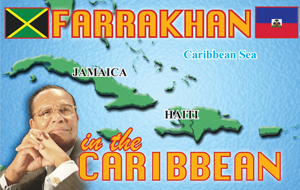 Minister Farrakhan warned the Caribbean is becoming marginalized, and the system cannot absorb those who have been educated at college and university level, thus, the problem of “brain drain” has led to the weakening of each territory. Brain drain accounts for a 50 percent loss in the labor force from the university level and approximately 30 percent loss of those who have completed high school in the country. Similarly, Guyana suffers an 89 percent loss in her labor force due to immigration, while Haiti experiences the lowest loss at 10 percent. The Minister pointed out the link between unemployment and the drug trade that perpetuates a cycle of criminality. To hearty applause, the Minister advised Jamaicans to assure food security and safety by seriously engaging in farming; he encouraged the Caribbean region to put aside petty differences and do more trade with one another to leverage collective power to resist being exploited by their former colonial masters. Abdul Akbar Muhammad, a top aide to the Minister, told The Final Call about 1,200 people attended the public meeting in Jamaica and Min. Farrakhan spoke at a theological seminary to Muslims, Jews, Christians and Rastas. A luncheon at The Gleaner newspaper also drew a cross section of religious leaders for a dialog with the Minister, he added. The Minister also appeared on Smile Jamaica television show. Another important part of the trip was a visit to the poor community of Trenchtown, which Min. Farrakhan called the neighborhood the real Jamaica and said that the poor must be cared for and given opportunity by those who are in power. The visit to Jamaica, the birthplace of Min. Farrakhan’s father, was enlightening and enjoyable, said Mr. Akbar Muhammad. “The Minister was received very well in Jamaica,” he said. Some Jamaicans also said they would work to research his family history and his father, whom Min. Farrakhan never knew. The Minister visited the Bob Marley Museum, named for the famed reggae singer, and was a guest on a radio show with popular host Mutabaruka. Nation of Islam student minister Hugh Muhammad from San Diego arranged the tour events and schedule, local Believers as well as London-based Student Minister Hilary Muhammad and Muslims who have relocated from London to Jamaica were also on hand, said Mr. Akbar Muhammad. Jamaican police and security forces provided for Min. Farrakhan’s safety while he was in the country.